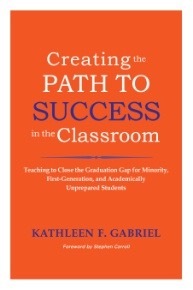 Kathleen Gabriel’s Creating the Path to Success in the Classroom is a clear, engaging, and practical book that will be of use to anyone teaching in a university or community-college classroom. In his forward to the book, Stephen Caroll praises Gabriel’s “deep integration of theory and practice” (xiii). This integration is one of the book’s major strengths. Gabriel introduces the reader to scholarship on barriers to student learning, student mindsets, and effective pedagogy. Extensively referenced and cited, Gabriel’s book is thus a primer on classic and more recent scholarship of teaching and learning. After describing this scholarship, Gabriel then offers practical suggestions of classroom strategies designed to engage students effectively given the data. These range from one-time strategies – reading a particular article on growth mindsets as a class, doing an active-learning activity – to strategies that unfold over the course of an entire semester. Gabriel offers concrete scripts for welcoming students and setting a classroom tone, giving student feedback that encourages persistence and growth, creating and shuffling small groups, and much more. Gabriel not only suggests what to do and why, but also encourages faculty to make those reasons explicit to students, making students intentional partners in their own learning. Gabriel explores strategies for creating a positive classroom climate during the first days of class, engaging students during the first month of the semester, growth mindsets and mental toughness, creating interactive lectures, motivating students to read, think about, and discuss course readings, integrating critical thinking and writing into class activities and assignments, and developing student resilience and persistence. In four appendices, Gabriel offers even more practical suggestions. For example, in her chapter on classroom climate, Gabriel notes that “one way that professors can increase their own cultural competence is to read both nonfiction and fiction material that addresses multicultural issues” (20). 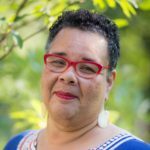 Gabriel then directs the reader to Appendix A, a list of nonfiction and fiction readings by authors of color that helped her expand her own “cultural competence and awareness” (131). 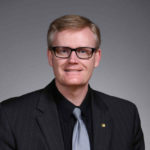 Gabriel is gentle in encouraging faculty to teach minority, first-generation, and academically unprepared students more effectively, suggesting incremental steps that faculty can take as they become more comfortable with new pedagogical strategies. She insists throughout that inclusive pedagogy not come at the expense of a rigorous academic standards: “We can design our assignments in a way that holds students to high standards, but, at the same time, we can give all our students encouragement, support, and resources so that they have ample opportunity to achieve those standards” (111). Creating the Path to Success in the Classroom will be helpful to teaching veterans and novices alike. In her opening chapter, Gabriel frames the book as designed to help faculty effectively teach and retain minority, first-generation, and academically unprepared students. As is the case with many implementations of universal design principles, however, these strategies ultimately improve student engagement and learning for all students.